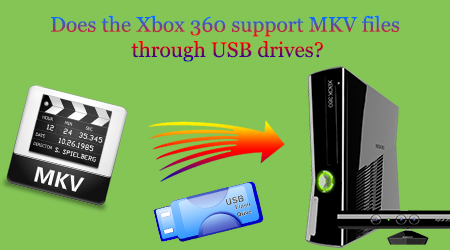 Q: How do I play or convert MKV files for my Xbox 360? I have HD .mkv files I’d like to play on my xbox. What is the best way to convert them to play? I am using the Windows 10 btw. A: Surely Xbox 360 is a perfect platform to playback HD video. In fact, Xbox 360 has strict requirement for the input formats and only WMV, AVI, H.264 and MPEG-4 are compatible with Xbox 360. In other words, it’s impossible to directly play MKV on Xbox 360. It is pity since MKV is an open standard free container format and very popular so far. Luckily, the following article will introduce two ways of how to successfully play MKV on Xbox 360. Download a free video converter program, like Koyote Free Video Converter, to the computer’s desktop. Double-click the file when it has downloaded. Follow the menu commands to install the video converter program. Restart the PC after the installation is done. Double-click on the video converter’s icon to launch it. Drag the MKV video file onto the icon of the video converter on the desktop. 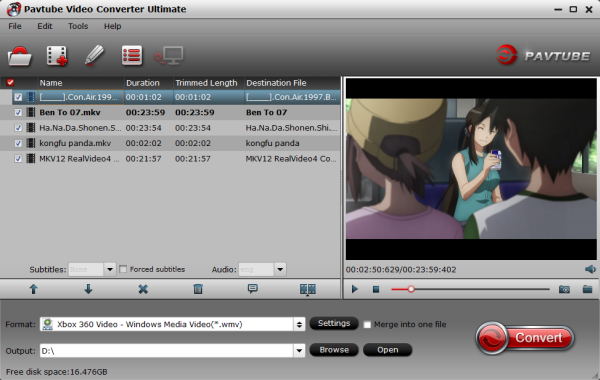 Highlight the MKV file in the top column of the video converter program’s main screen. Select “AVI” from the list presented in the “Output format” tab. Select “AVI – 28fps” from the “Video” drop-down menu in the upper right corner of the video converter program’s main screen. Select “Stereo” from the “Audio” drop-down menu in the video converter program’s main screen. Click on the “Browse” button next to the “Save To” tab. In the window that appears, navigate to the computer’s desktop . Click “OK” to close the window. Press the “Convert” button at the top of the video converter program’s main screen. Wait for the progress bar that appears at the bottom of the main screen to reach 100 percent. Quit the video converter program once the conversion is finished. Insert the USB flash drive into a USB port on the computer. Wait for the USB drive’s icon to appear on the desktop. Drag the AVI video file that was made from the MKV video file onto the USB drive’s icon. Wait for the AVI video file to be copied to the USB flash drive. Right-click on the USB flash drive’s icon. Select “Eject” from the pop-up menu. Remove the USB flash drive from the computer’s USB port. Insert the USB flash drive into one of the Xbox 360’s USB ports. Turn on the Xbox 360. Navigate to the “Video” tab from the Home menu. Select the USB flash drive’s icon beneath the “Video” tab. Select the AVI video file from the list of choices presented to the right of the icon of the USB flash drive. Press the “X” button on the Xbox 360 game controller to play the video. Just like the dilemma aroused in the beginning of this passage, converting MKV to Xbox 360 attracts much attention. In order to achieve converted MKV compatible to Xbox 360, we recommend a powerful MKV to Xbox 360 converter – Pavtube Video Converter Ultimate, it has the optimized preset for Xbox One and Xbox 360 from USB. With it, you can do batch conversion from MKV to Xbox friendly video files in simple clicks of mouse. Here is review. Besides, It applied as a professional video and audio converter as well as editor, this free app will make MKV to Xbox 360 process easy and efficient. If you are a Mac user, you can turn to Pavtube iMedia Converter for Mac (including El Capitan), which has the same function as the Windows version. Now download the right version and follow the tips below to finish your task. Advantage 1: Derect and simply convert MKV to Xbox. In others’ MKV to Xbox guide page, majority is on the assumption that your source MKV is H.264/MPEG-4 AVC video and AAC audio. If not, you need to learn other lessons like convert Divx, Xvid, MKV to MP4, MPEG-2 to H.264, AC3 to AAC, etc. With MKV to Xbox converter, you just need one single click. Advantage 2: If you finish the whole readings from VideoHelp/Quora forum, it may take you at least half an hour. Then if you follow with them trying to convert MKV to Xbox, it will take you twice or triple times. But using Pavtube Video Converter Ultimate, with one-click and a cup of coffee time (depends on movie length and quality), you can play watch MKV on Xbox. Click “File” button to open MKV file that you want to convert. Or simply drag and drop MKV to the main interface of the MKV to Xbox 360 Converter. Step 2. Choose a proper format for Xbox 360. Click “Format” drop-down list and choose ” Zune/Xbox 360 Device >> Xbox 360 Video – Windows Media Video(*.wmv)” as the compatible MP4 preset with best video quality. Step 3. Customize video specs for Xbox 360 (Optional). Step 4. Start MKV to Xbox 360 Conversion. You can hit the big red “Convert” to start converting MKV to MP4 with best video settings for Xbox 360. After the conversion, click “Open output folder” in the conversion window, or “Open” in main interface to quick locate the converted video. Now, you can use Windows Media Center, Windows Media Player, Windows Home Server or Zune Software to stream the converted media files to Xbox 360 for enjoyment without any problem. 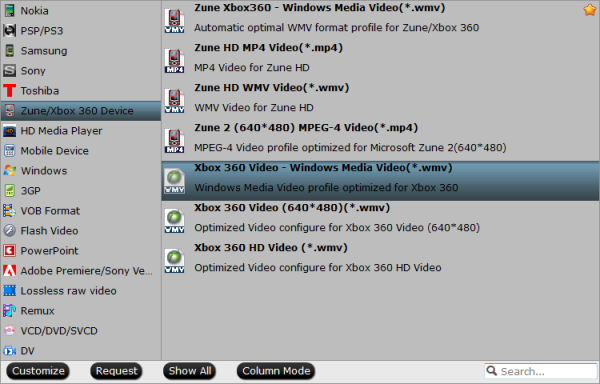 When you achieved MKV playback on Xbox 360 via USB, don’t you think Pavtube Video Converter Ultimate is fantastic? Is that all of the Ultimate Converter features? Of course Not! Highly acclaimed as Swiss Army Knife, this versatile video converter for Xbox 360 also functions as a strong performer for Blu-ray and DVD to Xbox conversion or playing MKV movies anywhere including MKV to iPhone, MKV to Zune, MKV to iMovie, MKV to PowerPoint, MKV to PS3, MKV to iPad Pro, MKV to Samsung TV, MKV to Android, MKV to QuickTime, MKV to BlackBerry, and MKV to Nokia etc.